Chrome Store Foxified: Enables the Google Chrome Store and Opera Addons Website for Firefox. Most of my browser life is in Chrome, but the memory consumption and CPU usage has increased so much over time so it, err, become less than optimal. Enables the Google Chrome Store and Opera Addons Website for Firefox. Point and click to install Opera/Chrome extensions straight into Firefox. 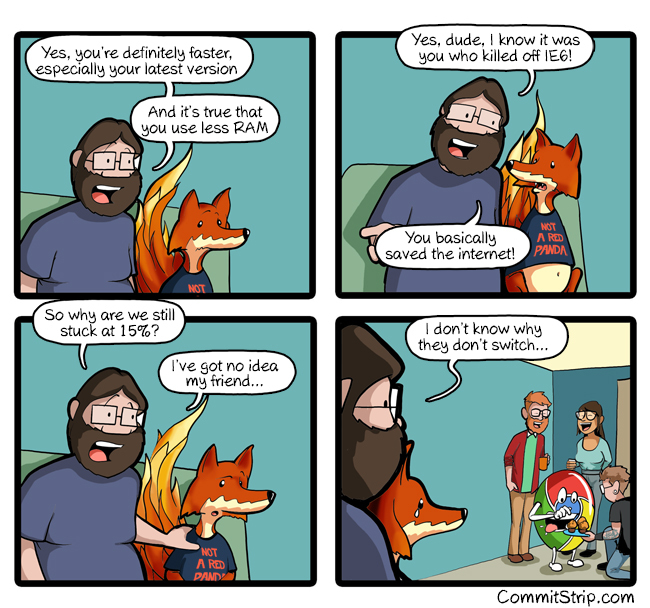 [WayBack] Hristiyan Dodov‏ @hristiyandodov: @CommitStrip Chrome Extensions. This entry was posted on 2017/11/27 at 06:00	and is filed under Chrome, Chrome, Firefox, Google, Power User, Web Browsers. You can follow any responses to this entry through the RSS 2.0 feed. You can leave a response, or trackback from your own site.